Some of you may remember a post in November where we had planned to show more vehicle concept art but didn’t because apparently vehicle design can be very very difficult (i.e., rage inducing). It’s not that difficult to create an original truck design that looks a lot like a real truck, or a pirate ship that looks like a real pirate ship. But when it comes to creating a vehicle that’s completely new, like say for example an amphibious SUV that looks like a sporty off-road recreational vehicle that can also go on water, you enter the realm of completely new and have to design the whole thing on your own. Anyway, Adam compelled me to have another crack at the amphibious SUVs since it has been well over two and a half months since last time I tried to work on it. So here’s what happened last time and here’s where we are at now. The good news is that I’m not filled with quite so much rage—okay, maybe a little bit of rage—but the bad news is that vehicle design still remains very difficult, but at least now I understand why. 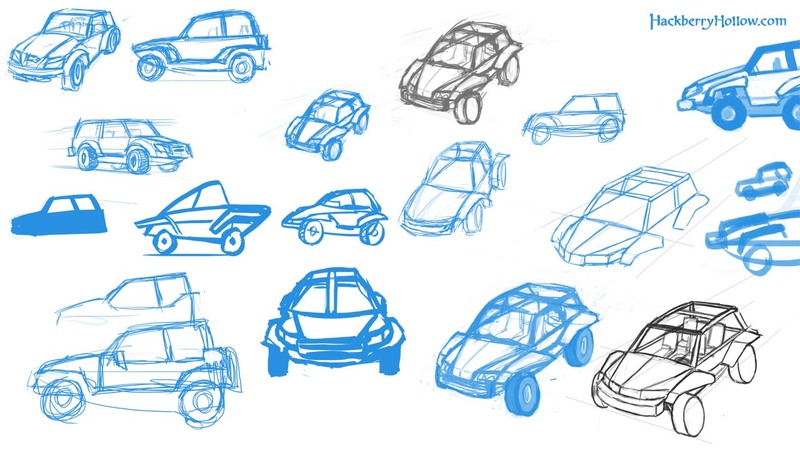 The reason why vehicle design so difficult is that most of the angles in a vehicle do not actually point at the vanishing point; the belt line is slanted, so is the roof, and the hood, the sides of the car point inwards, and to top it off vehicles have mostly curved lines instead of straight ones. Basically perspective lines can only be used as guides and you still have to eye ball most of it. Oh the rage! The first sketch I did was the side view of the SUV (the red one in the Blender screenshot). That wasn’t too bad because it was just a side view. However I wasn’t that happy with the design after I had time to look at it for a while. It looked too small and not heavy duty enough, which was due to the fact that the design was based on side-by-side ATVs. I wanted to do a 3/4 view so I could refine the design so Adam can start modeling it. So I made a 3D mock up, like I usually do, to help me work out the perspective. I realized again why I didn’t like the design but this time in fabulous 3D. I tried to modify the 3D model to resolve the design, realized that trying to edit the 3D model is too time consuming and I didn’t really know what I wanted anyway because I haven’t drawn something that I like, and trying to use it as a base for a drawing in Photoshop also didn’t work. So here we are at this week for round two. I did a complete reboot of the design: starting over drawing thumbnails. This was a a lot easier for me, still difficult though, but this time I didn’t worry too much about the perspective of my drawings (because I usually do, and yes I know the perspective on these are wrong). I tried a bunch of different things to see what worked. I tried to mostly draw 3/4 views because even though they are the most difficult views to draw they do provide the most 3D information about an object. 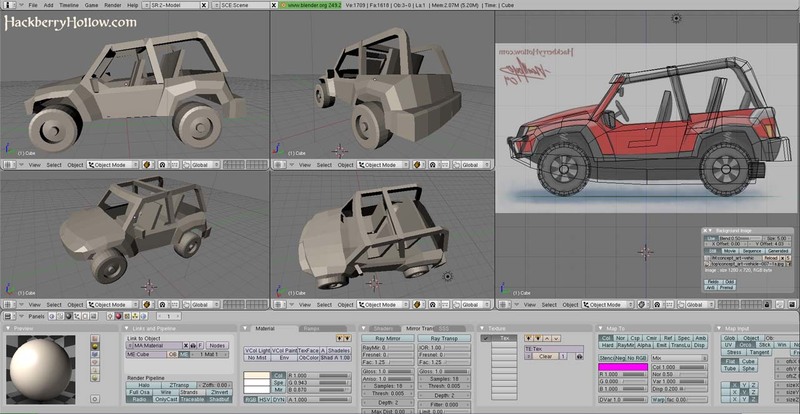 What I found was that doing a amphibious off-road truck design (something that actually looks more like an SUV) didn’t work very well, but I liked the roll cage and for a vehicle like this it would be necessary for safety reasons. So I kept the roll cage, made the front of the vehicle look more like a car, put the wheels out like a dune buggy (sand rail), and made the mudguards look like fins which fit with the amphibious nature of the vehicle. So far this is the most successful design for this vehicle in the story that I’ve come up with (marked in black in the image). I still need to try more things, and eventually create a 3D mock-up of it, but I think we got a good direction for that vehicle. Glen, I wish you the best on this. I know you don’t have much love for it.